If you are like most business owners and leaders today, you feel stuck working constantly “in” your business, for little return. Profit expert Steve Van Remortel has the solution to work “on” your business. 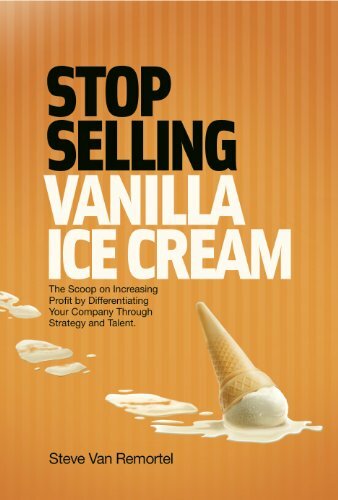 The Stop Selling Vanilla Ice Cream process offers an easy-to-follow strategic planning and talent development methodology that leads to real differentiation delivered by a high-performance team. You will discover the answer to the most important strategic question: Why will a customer choose you over a competitor? The unique planning methodologies in Stop Selling Vanilla Ice Cream address the business fundamentals of strategy and talent concurrently, because optimizing both leads to individual, team and organizational performance breakthroughs. Over 90 percent of Van Remortel’s hundreds of clients experience an increase in sales and profits in the first year after completing the process. Those same results and the process to create them are now available to you. • Find your competence and create the differentiation so tangible that customers will choose you over your competitors. • Adopt a talent management system that enables your organization to select, develop and retain the talent and skill sets needed to deliver your competence and strategy to achieve your goals. • Develop and implement department plans that, when executed, accelerate the success of your organization. The book walks you through the four phases: planning process preparation, building the team and strategy development preparation, strategy development and strategy implementation. • Phase One: Planning Process Preparation. Phase one is focused on collecting the content (specific issues and challenges of the organization) for the planning process. The planning team is selected from the leaders across the organization. The team members’ function is two-fold in phase one: they complete a series of behavioral assessments that are part of the Talent Management System and complete a preplanning questionnaire. The advisor meets individually with each planning team member to review their preplanning questionnaire and debrief their behavioral assessment results. Through the questionnaires and interviews the advisor collects all the content to design the rest of the process to resolve the identified strategic challenges of the organization. To complete phase one, members of the planning team prepare the financial analysis, sales analysis and market research in prep for the first team planning session. • Phase Two: Building the Team and Strategy Development Preparation. Now that all the content and data has been collected, the planning team now comes together to prepare to develop the strategy of the organization. To develop the optimum strategy the team must be able to address the company’s most sensitive issues. To accomplish this, the team completes a team development exercise we like to call “getting the team in their underwear.” Each team member presents their behavioral survey results to the rest of the team, which creates the most candid and effective discussions the team has ever had. After building a more cohesive team through this exercise, the team prepares to develop the strategy of the organization by completing the internal analysis (values, strengths, weaknesses and financials), and external analysis (market research), so the team has all the information to develop the optimal strategy. The team completes phase two of the process by creating homework teams and reviewing the action plans each team will complete to prepare for phase three. • Phase Three: Strategy Development. The strategy development phase of the process begins by having each homework team present their recommended competence, strategy and target markets for the organization. After each team presentation, the team starts developing the company strategy by deciding on the company’s competence and target markets, the competition’s area of competence, action plans to strengthen the competence and make it tangible to the target markets, and brand strategy that communicates their competence, mission statement and vision for the next 2-3 years. • Phase Four: Strategy Implementation. The final phase defines the plan to take action via strategy implementation and department planning. The team designs the optimal functional organizational structure to achieve the vision, discusses the skill set voids that need to be addressed, processes and communication systems that need to be implemented, and a business planning calendar. Company goals are identified for the next year, and a method of measurement is established for each goal. Department plans are developed to ensure each department works on the business and guides the company towards its vision. Lastly, a plan execution review is established to create an ongoing culture of discipline and accountability in the organization.